Deep in my Google Drive, there’s a list of topics for research projects, studios and seminars that I’d like to investigate someday. One area of knowledge that I really want to explore is the representation of landscape in popular culture. I want to understand what trees are most often posted in the background of people’s photos on Instagram. I want to see how gardens are portrayed in advertisements. What landscapes are shown in movies and hit TV shows. For today, I want to explore how landscapes are used in music videos. My attention was drawn to landscapes in music videos when my brother sent me the video for Calvin Harris’ Slide on a hot afternoon last summer. I was instantly attracted to the languid panning over Senegalese Date Palms (Phoenix reclinata), Washingtonias and Queen Palms (Syagrus romanzoffiana). A heavy green filter emphasizes the lushness of the tropical setting, a growing field of palms. All three of these scenes are presented in oversaturated colors and artificial materials, giving a dreamlike quality. After the scenes are presented distinctly at the beginning, they’re then montaged into a vaguer series of images pastiched together with landscape imagery drawn from the other music videos from this album. At the end, the camera zooms out to show that the individual scenes are part of a larger landscape in which the performers coexist without interacting with or visibly being aware of one another. Such a move emphasizes the scene settings (field of grasses and flowers, pond, jungle edge) as, not only flat backgrounds to the performers, but as part of a larger landscape in which art occurs. ​There’s a long history of landscapes - especially ornamental gardens - having a relationship to music, both as setting and subject. During medieval times, it was quite fashionable for the rich and privileged to create gardens as embodiments of paradise. Such gardens provided pleasure for every sense. 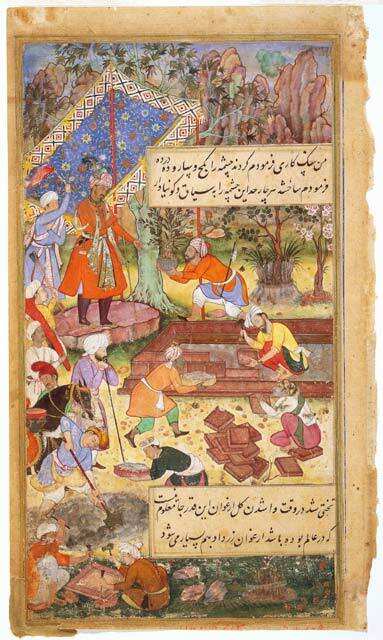 Illustrations documenting the Mughal Emperor Babur typically show the Emperor enjoying abundant gardens surrounded by attendants, some of which will be playing musical instruments. I particularly enjoy this fragment of illustration, which shows the Emperor standing under a multicolored pavilion supervising the construction of a garden while attendants play drums and lutes on the sidelines. Hmm, new ideas for my garden installation crew. European medieval gardens operated in much the same way, serving as miniature living paradises where courtly gentlemen serenaded courtly ladies as they wandered beneath blooming trees and across flowering meadows. For a taste of how these songs might have sounded, have a listen to The Rose, the Lily & the Whortleberry. It’s worth it just to enjoy that album name on your recently-played list. During the Renaissance, musical performance and public spectacle became an increasing component of the program for large gardens. Handel’s Water Music, for example, was composed in order to be played as part of an incredible spectacle in which the British King George and an entire orchestra boarded barges and floated down the River Thames. At Villa d’Este, in Tivoli outside of Rome, a gigantic organ powered by water was designed to blast music out over the surrounding countryside. After several restorations following its original installation in 1571, it’s still in working condition today. By contrast to these prestigious garden spectacles, the enslaved people whose work funded European wealth were retreating to the swamps of Caribbean islands late at night for communal vodou ceremonies. The swamps provided privacy, as well as access to the animals and plants which were central to this animist religious practice. Read Tell My Horse, by Zora Neale Hurston, for a first person account of a vodou ceremony in the swamps early in the 20th century. Given the tradition of outdoor performance that recurs throughout music history, it should be unsurprising that - when video technology was developed - landscapes would eventually emerge as a setting in movies and television shows. Fantasia is still, to me, a really interesting exploration of the potential relationship between animation and music. It explores the boundaries of what a theatre experience might be outside of the literal capture of performers singing and dancing. I find the Rites of Spring evolution sequence particularly interesting. The abstract possibilities of the relationship between animation and music are something that resurface in contemporary music videos. As recording and viewing technology improved, the sixties saw an explosion of musical movies that drew on the traditions of opera - but weren’t limited by the physical constraints of a stage set. Performers could be videoed singing and dancing through multiple landscapes. Possibly the most iconic image of 60s movie musicals is Julie Andrews twirling around on top of a mountain in The Sound of Music. If we want to look at the interaction of gardens with musical performance, the actors dancing through the Mirabell Gardens later in the movie is more interesting. The actors inhabit the gardens through dance, using their bodies to explore fountains, tunnels, walls, gates, piers, and stairs. Television and movies continued to become an ever-increasing presence in American and European life throughout the sixties and seventies. In 1981, when MTV launched in 1981 as the first 24-hour music television channel, people were highly accustomed to video within their daily lives. Videos such as Prince’s Sign O’ the Times and David Bowie’s Ashes to Ashes started to explore the possibilities of music videos incorporating an array of different settings. Irene Cara’s performance of What a Feeling from the movie Flashdance was one of the first songs to be pulled out of a movie as a music video on its own. It has a decidedly urban setting, incorporating landscape primarily as a setting. The video has a common narrative trope, of the protagonist of the video starting out her day with a bike commute, approaching a city across a river at sunrise, then along city streets to work. The center part of the video mashes up various, mostly interior clips from the protagonist’s journey, then ends with her busting victoriously out onto the street to embrace a loved one. This video is at the start of a long tradition of using urban streets as a setting for music videos. The introductory scenes of West Side Story, with the highly stylized and athletic “gang fights” utilizing the streets, alleys, walls and refuse piles in ways that would make any modern parkour practitioner jealous. More of my generation is the transgressive use of urban space explored in Beyonce’s videos - from the gymnastics of Crazy in Love to the Moses-fury of Hold Up with the yellow dress and baseball bat. In these Beyonce videos, the artist’s grace is emphasized by the rough ordinariness of urban streetscapes. These streets are a foil, something to be transcended through the artist’s performance. Some might argue that urban streets are a stretch when it comes to talking about landscape in popular culture. However, landscape encompasses all sorts of exterior space - whether plants are prominent or not. Just like the different scenes in the Calvin Harris Feels video discussed above, different landscape types are part of an all-encompassing larger landscape. Besides urban streets, another common landscape trope in pop culture is the idea of the Mediterranean/southern California “paradise” of sunshine, palm trees and the ocean. From Katy Perry’s sunshine-infused Santa Barbara landscapes in Teenage Dream to Lana Del Rey’s hypnotic West Coast, there’s an expectation that year-round sunshine is the ideal setting for human happiness. For European artists, the Mediterranean offers a similarly sun-filled setting with paradisiacal associations. Consider the closing scenes of Ella Eyre’s Together. The narrative of the video is of a group of friends who rent a van and go out having adventures, in a landscape that looks to be somewhere along the Mediterranean - presumably southern Italy or Spain. The video closes with an incredible panoramic view of the landscape, looking out over hilltowns to the sea, flooded with sunshine. This landscape evokes a feeling of pure pleasure. There’s an equally strong trope of the desert as a wilderness, place for human regeneration away from the pressures of daily life. Consider Lady Gaga’s video for Million Reasons, where the global music superstar is shown lying alone on her back in the desert, until she’s rescued and surrounded by friends. There’s also the incredible moment in Priscilla, Queen of the Desert where the queens perform an amazing lip sync performance of I Will Survive in colorful Abba-inspired costumes. Desert can also be used as the obstacle within the narrative - consider Elle King’s trial of wilderness for her lovers in Ex’s and Oh’s. This post began as an exploration of the role of landscape in music videos, a consideration instigated by Calvin Harris’s Funk Wav Bounces Vol. 1 videos. In questing to understand what types of landscapes appear in music videos and how they’re used, I’ve discovered that landscapes in music videos are often used as a sort of shorthand to convey complex settings and ideas. They are used as physical spaces to be inhabited and explored, as well as emotional spaces that support the narrative and themes of a song. In this brief exploration, I’ve discovered that there’s a wide range of nuance in the degrees to which artists explore both the physical and emotional space of the landscapes in which their videos are set. And I haven’t even explored landscapes as a theme in musical compositions. Enough for today, though. DJ Botanical has left the building. T.S. Eliot considered April was the cruelest month. For me, that cruelest month has always been January. April at least offers hope and springing green. January is bleak and cold, grey and brown. You’d think that I’d be hardened to the cold - I had five winters on the Kansas prairie, after all. But I’m still a wimp. I’m a Mississippi Valley boy who flinches at the breath of cold and cancels work at the threat of snow. Monet’s Le Pie, with its frosty white-blues and slash of shadow, is one of my favorite paintings. But I’ll sit and enjoy it from beneath a pile of blankets. It’s at this time of year that regional differences of climate and planting styles emerge in dramatic ways. In the southeastern part of the United States - late winter is a particularly weird time for gardens. The relatively warm temperatures, dramatic freeze and thaw cycles, plus abundant winter rains mean that gardens in the southeast have a range of winter issues that aren’t as troubling in other parts of the United States. Winter weeds, mostly annuals, are particularly problematic. They germinate abundantly in and around dormant gardens - emerging early in the season and crowding out tender emergent growth. Weeks of warm weather foster tender new growth which is then blasted to a quick death by sudden cold snaps. Lack of snow cover plus excessive freeze thaw cycles cause frost heave, damaging the tender crowns of tender perennials. Abundant rainfall cause vegetation to break down quickly, reducing soil cover and promoting erosion. Grasses that stand proud and sparkling in the heavy frost of colder regions, or delicately crowned with snow, are soon disintegrated into mush. As a designer, I want to understand how regional garden traditions and local plant communities have evolved to thrive in the unique conditions of the southeastern United States. Here are some strategies that I’ve observed for winter success. Evergreen Foliage Southern gardens are dominated by an A-B-C-M plant palette. That’s Azalea, Boxwood, Camellia, Magnolia for those not indoctrinated in the southern garden tradition. Many southern gardens don’t look all that different in January than they do in July. Brown turf with flecks of green, mounds and billows of green leaves - matte or shiny. Not a flower to be seen. In wild landscapes, you’re most likely to find larger evergreens buried deep in the forest - hidden specimens of southern magnolia (Magnolia grandiflora) or American holly (Ilex opaca) down in ravines, hidden from wind, sheltered deep in the midst of the forest. You’ll also find evergreens closer to ground level, tucked up against the warm earth. Flick your hand through the cover of leaves and you’ll turn over the delicate sprigs of partridge berry (Mitchellia repens) or Christmas fern (Polystichum acrostichoides). Densely Interwoven Plant Communities Plant communities that interlock closely - grass matrixes interspersed with low evergreen shrubs, forbes, and/or ferns - cover ground and protect the soil from erosion. Last year, at Kisatchee in northern Louisiana, I saw incredible communities built from an array of native grasses, interwoven with low plants of yaupon holly (Ilex vomitoria) kept small by fire, with incredible intermingled silver fronds of southern wood fern (Thelypteris kunthii). Layers of fallen plant material - pine needles, dropped leaves, branches, grass thatch - diffuse the impact of rainfall on the ground. Sporadic Winter Bloom Given North America’s often dramatic fluctuations in winter temperatures, it’s unsurprising that only a few native species find it worthwhile to devote their energy to producing winter flowers. Ozark witchhazel (Hamamelis virginiana) is one of the few that flowers in warm spells throughout the winter, starting in October and continuing through winter - depending on the individual plant’s proclivities. Species from many parts of Asia are less prudent. On a quick drive through any southern town, you’ll find cultivated favorites in bloom on any warm day - wintersweet (Chimonanthus praecox), Winter Jasmine (Jasminum nudiflorum), and Sweet Box (Sarcoccocca hookeriana humilis). Some Mediterranean species are also favorites in southern winter gardens. Think Christmas Rose (Helleborus niger) and Paperwhite Daffodils (Narcissus papyraceous). January has passed. The thirty day satisfaction guarantee to the New Year is up. February has arrived, bringing spring in its wake. Ready for it?